If you look at our photos shared, a number of our riders are women and young adults and our rider ages have a wide range from 16 to 60 years. We typically split into 2 groups: the regulars and the noobs. 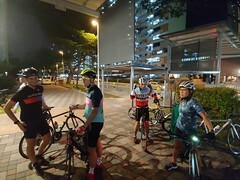 Routes on Fridays are the Western side of Singapore, at that time of the evening, traffic thins after 9pm. 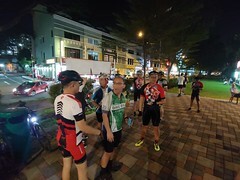 With the new rules and speed limits on PCNs, the newbie rides for Saturday mornings have to be at locations where the roads are quiter and so far, we have identified Seletar Aerospace Hub as a good route. We will be encouraging riders to ride the “horseshoe circuit” on the road as it is 10km each time. Also it allows riders to build up confidence while on the road. 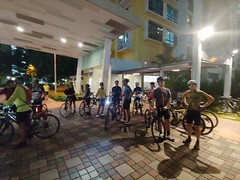 3-4 loops around Seletar Aerospace hub at night. This one is just sustained rides at the average 28-30km/h pace. We have strong riders who pull the rest and it is a ride regime that allows you to train up your stamina. JTC Corporation formerly known as Jurong Town Corporation, is a Singaporean state- owned real estate company and statutory board under the Ministry of Trade and Industry headquartered in Jurong, Singapore. Established in 1968, the company was set up by the Government of Singapore as the country’s principal developer and manager of industrial estates and their related facilities. Always associated with factories and industrial development, one would not think they only developed concrete based buildings but this Aerospace Hub development is one unique project. 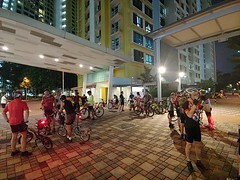 Often we think of only private jets (Seletar Airport) and you see very big factories (also very quiet) names ( Rolls Royce, Hakwer Pacific, Bombardier etc), it is a very popular spot for cyclists as it offers relatively quiet roads to cycle and yes there is the Oval. On weekend evenings, I see plenty of dog owners bring their dogs toget a chance to run around. There are nice places to grab a bite and plenty of Black/White Bungalows and ex Airforce quarters AND Trees..majestic trees that can be found. We joined a Discovery ride and were given a treat to marvel at a really great tree and had a group photo taken. I have seen the development of this location having cycled here upteenth times over 15+ years and when you see how the government Boards work together to create a unique atmosphere such as this location, Seletar has become a “happening” place where one can cycle, enjoy nature, listen to the birds chirp away, grab a bite and just idle time away. I just love the way this place has evolved and we call Singapore our home. Keep up the great work JTC! Tern – Link A7, stepped down from Link B7/C7 ( no front luggage truss mount) at S$499, is the 3rd iteration of the value foldable. and 7 speeds Junction 1507 S$499 that offers the new benchmark for a 7 speeds foldable at this price tag inclusive of rack and fenders. How can one forget Dahon? So many reasons you’d buy a foldable bike from us. Cost of ownership: The average ownership of a well designed foldable that you could own and ride for 2 years. 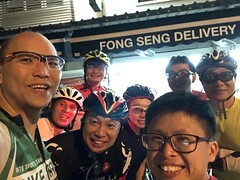 That’s only a less than S$20/mth for TWO years (or 67 cents a day investment), a small footprint, comes with gears and gives you plenty of natural endorphins each time you cycle. Do the maths, you’d understand why you should buy a reputable brand – it’s truly affordable now. What if you want something better? 20% off Prices for Launch promo. Hippo devices are medical grade and are bluetooth connected so that the Hippo App tracks the Blood pressure and track your body fat. If you are trying to live better, watching your weight and blood pressure is required. Taking care now for our years when we get older is an act of kindness for the ones who will be taking care of us.